DML2017 Will provide shuttles to and from the Hotel Irvine and The Duke Hotel, Newport Beach to the UCI Student Center before and after the conference. 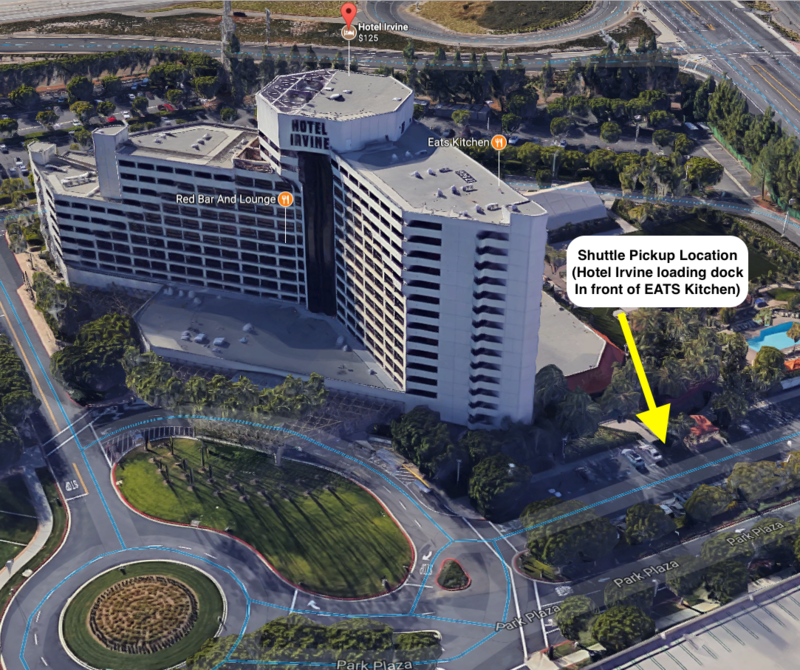 Pick-up area: The shuttles will pick-up by the valet area at the Duke, and at the side entrance by EATS restaurant at the Hotel Irvine [image of Hotel Irvine pickup location]. Buses will leave promptly. Please make sure to arrive early. Drop-off area: The shuttles will drop-off by the main UCI administration building. Please follow the signs to the UCI Student Center. Hotel Irvine Guests: Please note the one-time pick up schedule in the morning. If you don’t catch the bus at the time, you can take an Uber/Lyft/taxi to UC Irvine. Duke Hotel Newport Beach: We will reserve taxis that will pick-up in the parking lot. Please note that we will only provide a one-time pick up schedule in the morning. If you don’t catch the bus at the time, you can take an Uber/Lyft/taxi to UC Irvine. Duke to Student Center (Taxis- DML will reserve transportation for you. Taxis will pick-up in the parking lot adjacent to the property). Hotel Irvine to Student Center (2 shuttles will pick-up in the loading area by the EATS restaurant). Hotel Irvine to Student Center (3 shuttles will pick-up in the loading area by the EATS restaurant).